From the getting the taxes done late department.. Thanks to Richard for the show details! 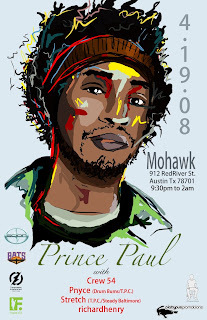 Prince Paul @ Mohawk on April 19th with Crew54, P-Nyce, Stretch, and richardhenry! Tickets are $10 and you can get them here! I just learned something goofy from my brother this weekend. Ever been Rick Rolled?!? Whoever came up with that had one sick sense of humor! Prince Paul is the stage name of Paul Huston, a DJ and hip hop producer. Originally a member of Stetsasonic, he produced tracks on hip-hop albums such as 3rd Bass' 1989 debut album The Cactus Album and De La Soul's 1989 debut album 3 Feet High and Rising. After two more albums, he left them, putting together two solo projects: Psychoanalysis: What is It? and the hip hop opera A Prince Among Thieves featuring Big Daddy Kane, Xzibit and Everlast. He, along with Frukwan of Stetsasonic, Too Poetic of Brothers Grimm and the RZA of the Wu-Tang Clan, made up the Gravediggaz. Alongside Teo Macero, Prince Paul co-produced guitarist Vernon Reid's solo debut in 1995. Paul teamed up with Dan the Automator to form Handsome Boy Modeling School; their album So... How's Your Girl? featured diverse names from Sean Lennon and Del tha Funkee Homosapien to Alec Empire and Don Novello. In the year 2000, Paul produced I Hope I Sell A Lot Of Records At Christmastime by Princess Superstar as well as MC Paul Barman's début EP It's Very Stimulating. White People continued Handsome Boy's tradition of strange skits and an odd mix of guests over Paul- and Automator-produced beats, including RZA, Linkin Park, Tim Meadows, and John Oates.